Well our big Macmillan effort made £350 on Friday afternoon, thanks to a great team effort. My new pedometer/watch registered 11,500 steps or close on eight miles – my highest yet, and that was just walking round the kitchen, up and down the corridor to the tea rooms, filling tea and coffee pots and dodging round our cheerily chatting customers to pass the buns. Big shout-out especially for our youngest baking donor, Eilidh, who at the tender age of 14 made a huge batch of beautifully, neat, uniform Empire Biscuits such as I could never do in a thousand years. Sorry about the negative note in the title … I am strongly exercised by the need to avoid developing Type 2 Diabetes as the years go by. So now that the sugarfest is over, it’s back to the healthy stuff. I said on Friday night that I’d never eat cake again … naturally that barely lasted the evening! However – the time has come. Here’s a ragged smile on a plate of smoked mackerel pate which I hope demonstrates my joie-de-vivre at the prospect. 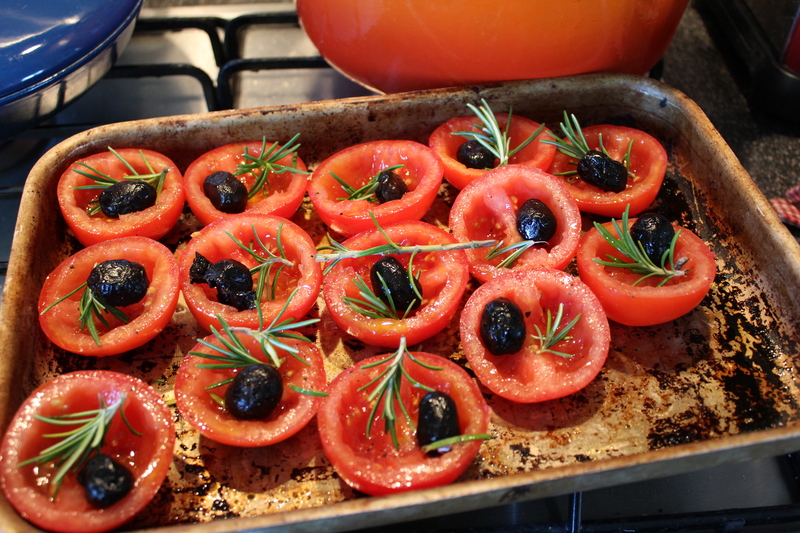 And here’s a good and easy – and healthy – thing to do if you have a greenhouseful of lovely tomatoes and are running out of ideas: just cut them in half through their equators, scoop out the seeds, sprinkle with olives and herbs of your choice, and dry them (you could hardly call it baking or roasting) at 50 degrees or as low as you can get your oven to go. After several hours they should be tastily chewy and not too charred (stop when they char as they’ll taste bitter). Put them in a screw-top jar and fill it up with a nice oil. A mixture of your best olive and a common-or-garden sunflower will do fine. Add a garlic clove or two, a chilli if you like it hot, a sprig of rosemary for visual effect, and any other herb you fancy. They’ll keep for up to three months, and give an instant, gorgeous oomph to a fresh tomato sauce. Here’s health!